Not only will this be a fantastic opportunity for drum enthusiasts to learn djembe and Dun-dun with Leon Patel, a truly inspiring teacher, but what's more is that all the proceeds are being donated to Kartong festival in the Gambia. We love Kartong festival, some of us performed there a few years ago, so are really happy to help support this worthy cause, We are also excited to collaborate with Global grooves and be part of an awesome event. Heat up the winter months with Global Grooves. Join Leon Patel for this afternoon session exploring West African percussion arrangements and techniques to help raise funds for Kartong Festival 2018. 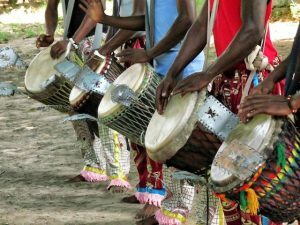 Focusing on percussion styles from West Africa we will use Djembes and Djun Djuns to explore West African percussion arrangements, solo phrasing, and techniques. The session will be an opportunity to explore new music, brush up on your existing percussion skills and learn new arrangements while having fun with like-minded folk. The class is suitable for complete beginners to advanced percussionists with parts and phrasing offered to suit your experience level. This workshop is also suitable for dancers wishing to increase their knowledge of West Africa music. The workshop will be in aid of Kartong Festival 2018 in The Gambia and all proceeds will be donated directly to Kartong Festival Committee to help deliver the festival.